There's a lot more to the Envy 14 Beats Edition than just good sound quality. This is an extremely powerful notebook, both in terms of everyday and graphical performance, and it provides the sort of power we'd expect from a much larger desktop replacement machine. The notebook is also portable, making it a genuine option as a travelling companion. It's currently the done thing in the laptop world to be kitting your machines out with high-end speaker systems. Asus was one of the first with their Bang & Olufsen NX90 notebook, and MSi followed shortly with the GX660R, a machine that boasts a Dynaudio system embedded in the chassis. 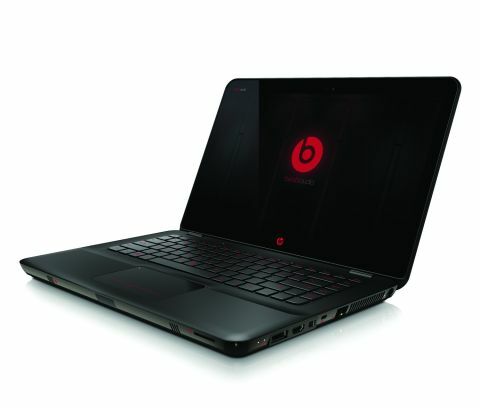 HP has gone another route with the HP Beats Edition, and employed the help and expertise of legendary Hip Hop producer Dr Dre and his Beats brand, that manufacturers high-end headphones. Built around the chassis of a standard Envy 14, but £400 pounds more expensive, the HP Envy 14 Beats Edition features a number of audio upgrades. These include specially designed Beats speakers and clever positioning of the notebook's sound card, allowing for impressive sound quality when using the bundled Beats Solo headphones. Aside from the audio upgrades, the Envy 14 Beats Edition boasts a new black rubberised chassis that we rate very highly, and a series of cutting-edge components that make this a very powerful machine.